I’ve decided on a new resolution, not for New Year’s, but regarding my visits to Euskal Herria. The thing is, I visit, I spend a lot of time with my dad’s family which I of course greatly enjoy, I see some friends (though not nearly all of them), and I come home. 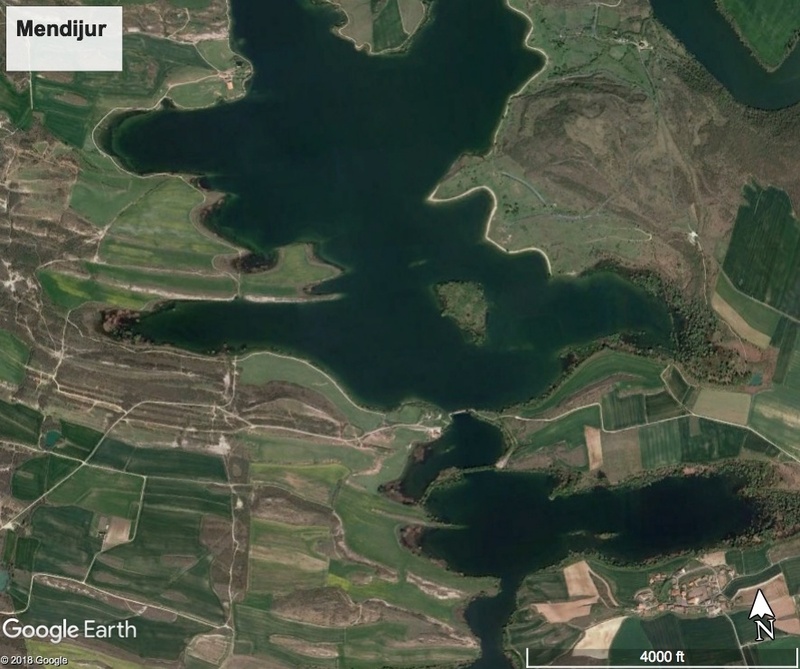 I don’t end up seeing anything I hadn’t seen before in terms of the cities, the countryside, museums, or anything else. So, I’ve decided to make an effort that, each time I visit, I see at least one new place. I was in Euskal Herria during Semana Santa and, following up on my resolution, I went to see Pasai Donibane. With a good friend, Gontzal Aranguren, we left Donosti and drove to Pasai, which is actually a collection of neighborhoods on the outskirts of Donosti. This area is the big port of Donosti, with massive ships coming and going (though we didn’t see any enter or leave the port, there were ships docked in the port). To get to Pasai Donibane, you have to pay a man 1 euro to take a small boat across the water to the other side, where Pasai Donibane looks back towards Donosti. Pasai Donibane is sometimes referred to as the “little Basque Venice.” This, of course, overstates things, as nothing really compares to Venice itself, but it has its own charm. 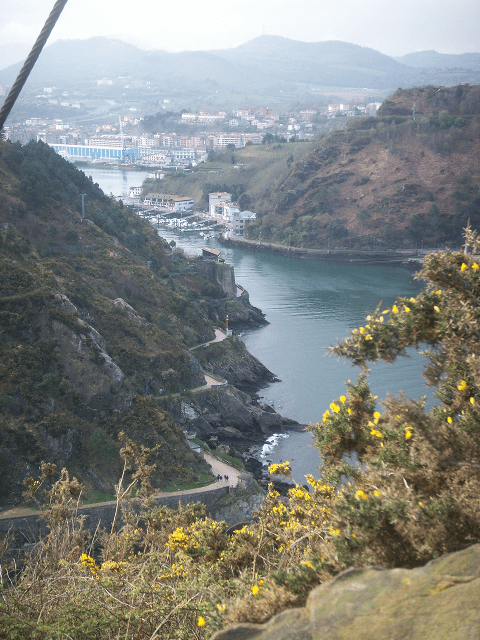 We got there pretty early in the morning and followed a small path outside of the village up the hillside overlooking both the port and the ocean. Not an overly long hike, but it does go up a bit in elevation relatively quickly. The views were magnificent! We then hiked back to Pasai Donibane and walked around a bit. Being early in the morning, not much was open, but the streets, if you could call them that, were glistening with water, reflecting the colors of the apartments overhead. The cobblestone streets barely allowed one car through — there are more than one corner where side mirrors have worn groves into the buildings. If two cars tried to go in opposite directions down the main thoroughfare, one had to back up to an opening in the road to let the other pass. An interesting historical note about Pasai Donibane: Victor Hugo, of Les Miserables fame, spent some time here in 1843 while traveling in Spain. Some say he was inspired to write Les Miserables while staying in Pasai Donibane, overlooking the nearby Pasai San Pedro and Pasai Antxo, which were more industrial. It isn’t clear if this is some apocraphical story or if there might be some truth in this claim. 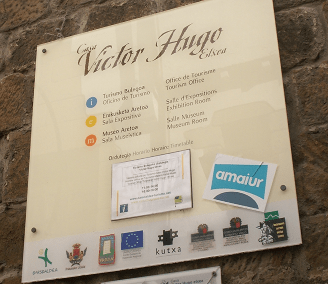 In any case, as anywhere else, Pasai Donibane has capitalized on this brief encounter with history by establishing the “Victor Hugo Etxea“, or Victor Hugo House, which is a small museum that describes his stay. It was closed when we were there, but for the history buff, it might be worth a quick visit. What is clear is that Hugo wrote his Voyage aux Pyrenees while living in Pasai Donibane. Pasai Donibane is also known for some good seafood restaurants. Again, being there early in the morning, we didn’t take advantage, but it might be the perfect place to spend a romantic evening for two, overlooking the water with the bright lights of Donosti in the background. Pasai Donibane is no Venice, but it has its own charm. The brightly painted apartments crammed between the hillside and the waterfront plus the breathtaking vistas from the nearby hills are a combination that is truly spectacular. A history note of interest to Americans: it was from Pasai Donibane that Lafayette set sail for America to aid the Americans against the British during the American Revolution. 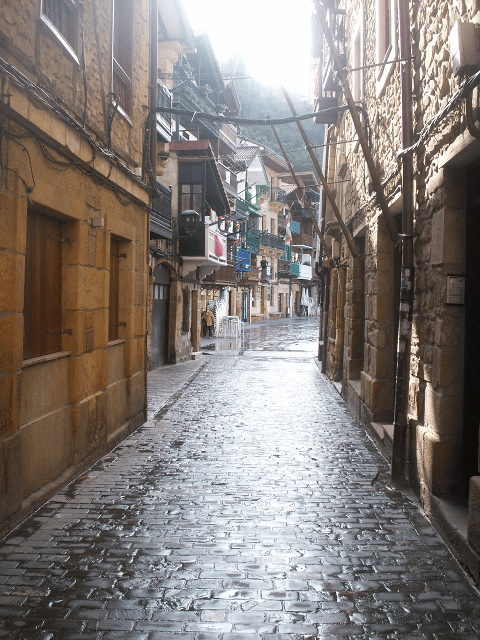 Great article about one of the lesser known magnificent corners of Donosti. This city is beautiful all around. Love your fish eye photo at the top. Nancy Zubiri, Editor, Euskal Kazeta.